10 days intensive ashram period. Each day starts at 6.00 am and ends 9.00 pm. 9 hours of teaching per day. Standing poses, forward bends, backbends, converted poses, twisted poses: principles and practice, where a posture begins, how to go into a posture, hold a posture and come out of the posture. Alignment, contraindications and benefits of a posture. Anatomy and physiology of the body, and of the postures. Relaxation, (yoga nidra) the dynamic of it and technique. How to lead it. Sessions in Reykjavík, three times a week for yoga classes. The students practice teaching with the senior teacher, and continue studying the above curriculum. Students continue to come to yoga classes. This goes on for 6 weeks. 5 days intensive ashram period. Continuation of all the aspects of the curriculum, going deeper into the teachings and the practice of the students becomes deeper than before. Sessions in Reykjavík with 3-4 weeks of teaching, same as module 2, ending with a graduation. All the aspects of the curriculum is taught simultainously. In the first module the emphasis is on the physical aspect, the practice, the philosophy and the teaching methodology. Closer to the end we focus more on the business side and maintaining the students, the hindrances they might go through in the classes. Student must fill out the application form found under: http://kristbjorg.is/namid/jogakennaranam/i-240-timar/umsoknareydublad/ on the schools website, kristbjorg.is. When the student has been approved he will get a confirmation email, then he has 4 days to pay the confirmation fee. The fee should be payed in full the week preceding the seminar. If needed it is possible to pay in sequences, then the student and the school make a written agreement and an additional 20.000 iskr will be added to the total fee. Included is the fee is the teaching manual, all the teaching described in the syllabus, fee for accommodation and vegetarian food while staying at the ashram along with the yoga teacher certificate issued at the end of the program, if all requirements have been met. Excluded from the fee are all books needed for the program, except the teachers manual, the books must be acquired and payed by the student. The student must arrange his own travels and pay any cost it might include. The senior teacher teaches at least 90% of the total hours of the program. The school has a right not to graduate a student if he is thought to lack in understanding and skills of teachings. The senior teacher helps the students to complete the training to his satisfaction upon agreed terms. All teachings are conducted in Icelandic. Student must have had at least 2 years prior yoga experiences on a yoga mat before applying for a teacher training. 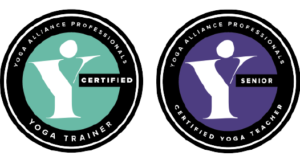 The yoga teacher training is accredited by Yoga Alliance Professionals and the graduates can join the Yoga Alliance Professionals as full members after their graduation from the course. Also, while on the course the students can have a free basic membership with Yoga Alliance Professionals while conducting the yoga teaching course. The students will then have the option to get an insurance in Iceland or even in UK. All behavior of the students as well as the teachers must be conducted in concurrence with the yogic teachings. Ahimsa, satya, aprarigraha, brahmacharya and asteya are the foundation of yoga and we expect all the students and the teachers to live by those codes of conduct. Each student has to be 100% present in the intensive courses conducted out in the countryside, she/he has to attend 90% in other classes, unless with a special permission from the teacher or if sick, then delivering a certificate from a doctor can be required. Some classes will be recorded for the purpose of a sick student that may not be able to attend and then she or he can listen to the teachings later. Or the sick student can be on Skype listening to the teachings. Each student has to practice asanas and pranayama every morning while the course is running, in their homes as well. One yama is to be thought of each day. Students have to teach 20 classes each, where they create and conduct the class and practice teaching on family or friends. Then they turn in their work to the senior teacher. All students are required to write an essay on one chosen yama to be turned in. Another essay is also mandatory about one of the sutras of Yoga Sutras of Patanjali. The student has to take care never to be late for any class. If a student does not show up in the course and fails to give notice the confirmation fee will not be refunded. If a student has to pull out before the course starts and sends an written notice, such as an email, provided he has good reasons, we pay back in full. If student pulls out in a middle of a course, he will be refunded half of the amount. The school reserves the right to cancel courses at any point, thus refunding the confirmation fee. Talk with the senior teacher and the school master about the issue of complaint. If matter remains unresolved we suggest a formal written complaint to the School which will respond within 2 weeks the latest after review and assessment. If still the matter remains unresolved then it is within your right to send your complaint in writing to Yoga Alliance Professionals. The school is continuously improving the training program with the assistance of feedback provided, from the guest teachers and the evaluation feedback from the students which they hand in in the middle of the course and then upon graduation.